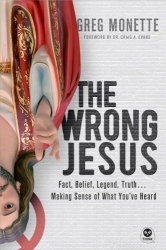 Journey into the historical records, from ancient writings to archaeology to cultural and behavioral sciences, and discover whether Jesus really was who the Bible says. This fascinating exploration, created especially for high school and college-aged students, features sections on His words and deeds and whether He ever existed at all. Examine the evidence for yourself. Why Does History Matter ? What Are Our Main Sources for Knowing About Jesus? Has the Text of the New Testament Changed Over Time? How Does Archaeology Help Us Understand Jesus' World ? Is the Birth of Jesus Just a Legend?